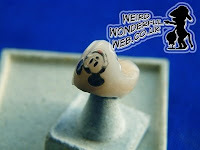 Weird Wonderful Web: Tattoos for teeth! Get your teeth into some art with these tooth tattoos. So, maybe you've always wanted a tattoo, but have been too worried about pain or infection. Or, you're worried about your body shape changing over the years and what effect that would have on your design. Perhaps you are looking for something quite discreet. Maybe even something so discreet you wouldn't want people who might see you naked to even see. What you need my friend is a tooth tattoo! Yep, you heard (read) me. 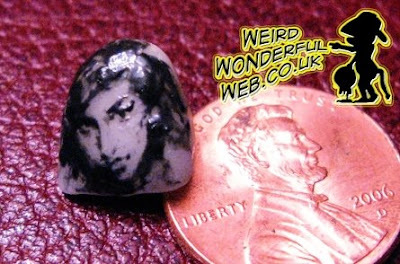 "custom artwork hand painted tooth tattoos"
They can create tooth art for you in the design of celebrities such as Amy Winehouse. They also have examples featuring David Beckham, Tiger Woods, Abraham Lincoln, David Letterman, Elvis and, most disturbingly, Simon Cowell! (pictured right). Imagine that! 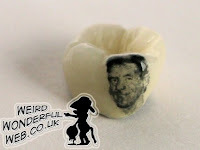 Simon Cowell in your mouth! Doesn't bare thinking about. We're used to seeing him chewing up and spitting out talentless wannabes on TV, now he can help you do that with your dinner. Possibly celebrities aren't your thing. But what about some global branding in the shape of a well known cartoon mouse. I wonder what the Disney corporation would have to say about that? Here they have cunningly photographed it with the image upside down. Haha. 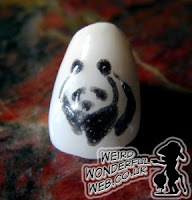 They also do quite a nice range of real animals, such as bald eagles, falcons, geese, wolves, a very colourful rooster and this nice simple panda. So it seems you can ask for pretty much any custom design and their artists will give it a go. "technicians were trained first to be artists and then taught how to construct teeth." Apparently, if you change your mind later, the design can be removed from your teeth by your dentist with a little grinding.